Collingham Medical Centre's first PPG was established in 1982. The current Collingham Medical Centre PPG first met last October 2017 and maintains a maximum of 16 members. The National Association of Patient Participation (NAPP) on http://www.napp.org.uk/ defines a patient group as a unique partnership between patients and their practice which is essential to and results in high quality and responsive care. Our Terms of Reference have been agreed at the December 2017 and during January 2018 some members will be supporting patients to offer feedback about services and navigate around services. You can also complete the Patient Group Sign-up Form below and we will contact you for further information. 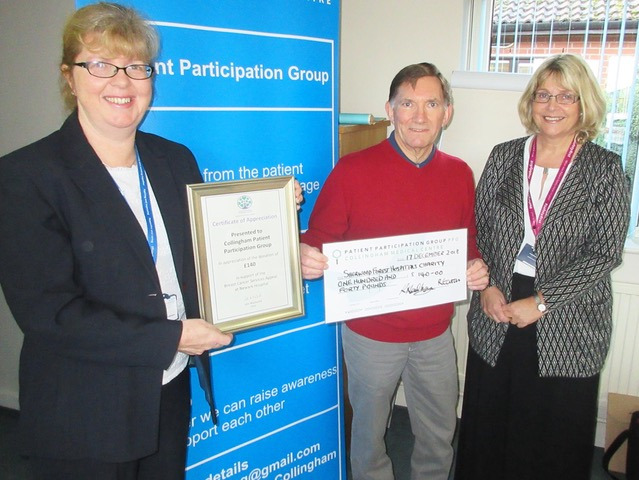 The Patient Participation Group meet every month. The next meeting will take place at Collingham Medical Centre on Monday, 20 May 2019 at 11.30 am. The Annual General Meeting of the PPG will be held on Monday, 20 May 2019 at 2.30 pm. 1. Can we receive the newsletters electronically? Select “Newsletters” (under Further Information) and click on the “sign up here” link. Enter your name and email address and you will be added to our mailing list to receive future newsletters directly into your email inbox. Or, you can continue to pick up a copy from the usual distribution points. 2. In addition to being able to cancel your appointment by phone, in person or online, patients felt it would be useful to text. We now offer patients the ability to text the surgery to cancel appointments. At this current moment in time we can only accept requests to cancel appointments by text, all other queries and requests (ie booking appointments, ordering repeat medications) must be made by telephone or in person. 07498 083528. We are unable to accept telephone calls to this number. Please remember to include your name and date of birth so that we can quickly identify who the message. As a rural location, we are having some bandwidth issues. 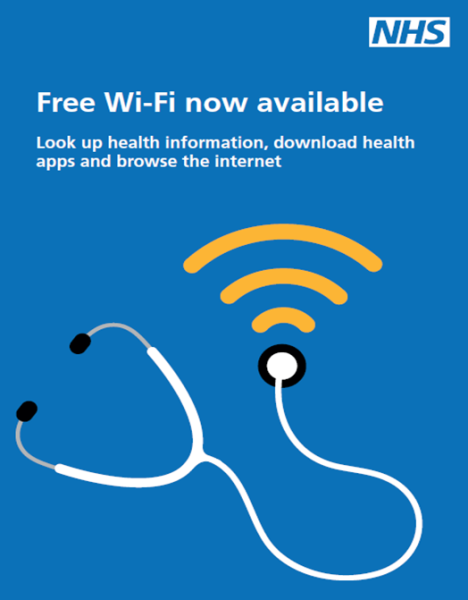 Public Wi-Fi is available, speeds are slow and the NHS IT guys are liaising with the networks to improve the speed. 4. 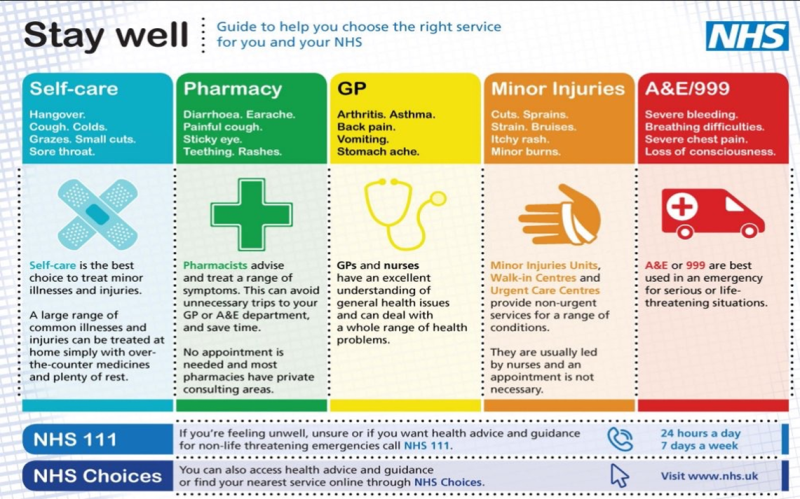 Please improve access to GP, same day acute problems & nurse appointments. We have redesigned the skillset of the team to meet todays’ healthcare needs. 6. Why do the letters I receive from Collingham Medical Centre look like circulars or junk mail? The envelope may look a little different, now we use unique mail management for some of our letter printing and mailing needs. This allows us to reduce the time we invest in this process and the costs so that we can reinvest in clinical time. Docmail uses the NHS IG recommended 256 bit RSA encrytion for sending the letter image to their printer. The standard delivery of letters remains unchanged as Royal Mail Standard Class (2-3 days). Docmail is environmentally friendly too, accredited to FCS (Forest Stewardship Council). 7. Why do team members not put their names on the bottom of the letter? 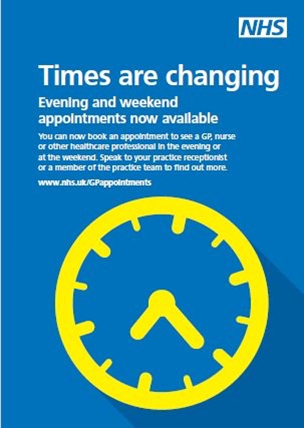 As most of the NHS team work long days but not 5 days a week (they can work 40 hrs over 3-4 days due to our opening hours). We had made the decision to allow flexibility in order that a patient does not feel that only the team member who has signed the letter can answer the query. We can see the team member who generated the letter to ensure that there is accountability in your care. That said, a number of patients recently have not been happy with this approach and suggested we consider re-instating a personal signatory. We now ensure there is a named individual on each letter for your reference. 9. 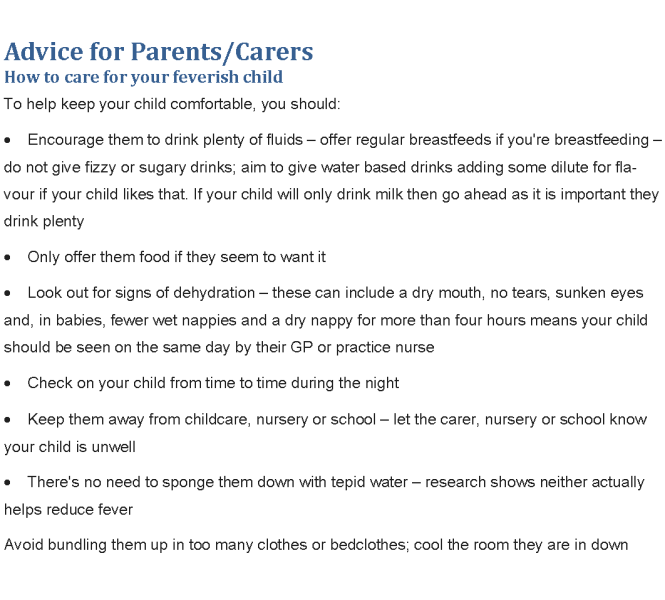 How do I care for a Feverish Child?